These two dresses are from Ackerman’s Repository of Arts, Literature, Commerce, Manufacture, Fashion and Politics. Series 1 Vol 1. PLATE 1. – WALKING DRESS. A polished bonnet, and mantle of gold-coloured velvet, with an invisible hood trimmed with ermine; an antique collar fastened with a gold ornament in front, in form of a shell. 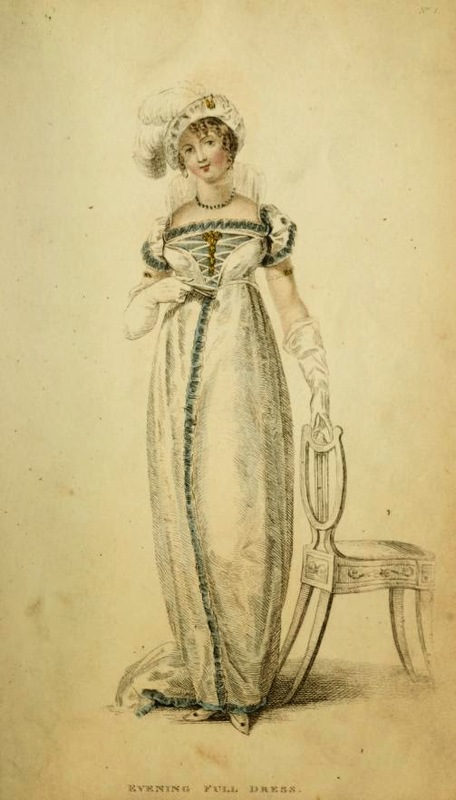 Morning dress, white muslin Brussels spot, with a worked stomacher, trimmed down the front and at the bottom; worked long hanging sleeves, twisted and fastened at the wristband with a small gold ornament, of the same form as that which fastens the mantle and cincture of the dress; sandals of gold-coloured cloth, laced with brown cords and tassels; York tan gloves. A white satin Spanish hat, with a diamond loop and Spanish plume; diamond ear-rings and necklace; the hair full, in ringlets; a white satin dress, full-trimmed with blue velvet, with a lace medicis round the back and shoulders; an antique stomacher ornamented with diamonds mounted in gold; white satin shoes with gold bows; white gloves and fan. The prevailing colours are dark brown and bottle green. The coat for evening dress is cut rather long in the waist, and short in the skirts, double breasted, with pointed lappels, corresponding in length to the hip button; the lapels are padded to fall back with the collar, which is made pretty high and stitched narrow, the collar to fall back about an inch and half; deep pockets under the cross flaps; the cuffs round. The morning dress is made in nearly the same manner, only the pockets are in the plaits of the skirt, and the cuffs are either round or with a flap and three buttons. The buttons are either gilt basket, or moulds covered with cloth. Waistcoats are made single breasted, with a small flap about two inches lower than the coat lapel. Breeches are not made so high by two or three inches as they were, and kneel-band extends almost to the calf of the leg, with four buttons at the knee; they are made very tight: and pantaloons are pretty generally ornamented up the sides with brade.